Hey folks, Valkor here. Crossovers are a big deal when it comes to the companies that own their respective properties and the fans that wanna see these worlds brought together. Sometimes it's a hit (The Critic and The Simpsons) and sometimes it falls flat (that whole Marvel/DC/Amalgam fiasco). One of the biggest misses I can recall was when the Power Rangers (In Space) met with the Teenage Mutant Ninja Turtles… yes it actually happened and it was horrible. But one of the most highly anticipated crossovers and one of my personal favorites is available now as part of the Hanna Barbera Collection – The Jetsons Meet The Flintstones!! 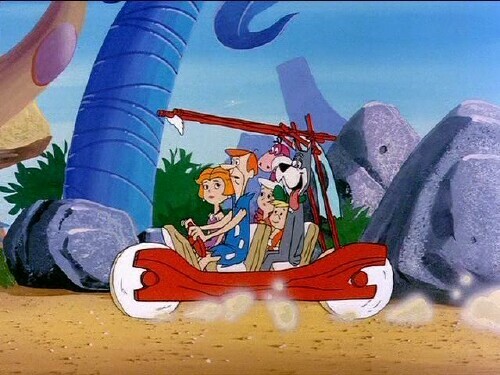 In The Jetsons meet The Flintstones, Elroy Jetson creates a time machine that sends his family, which includes George, Jane, his sister Judy and dog Astro back into the Stone Age where they meet up with the Flintstones (Fred and Wilma) and the Rubbles (Barney and Betty), who were out on vacation. Fred takes advantage of the situation by using George's future technology to help him get his job back – a job he lost, while getting caught at a poker match with his boss Mr. Slate (He was supposed to be wroking OT). 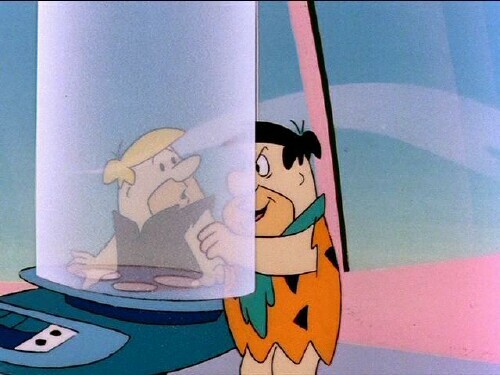 When it's time for the Jetsons to return to their own time, they attempt to take a picture of the Flintstones under the time machine. Unbeknownst to them, in the future, Rosie, along with janitor Henry, his assistant Mac, and George's computer R.U.D.I put together a time retrieval unit that is supposed to bring back the time machine, in case anything happens to it (Elroy thinks of everything). 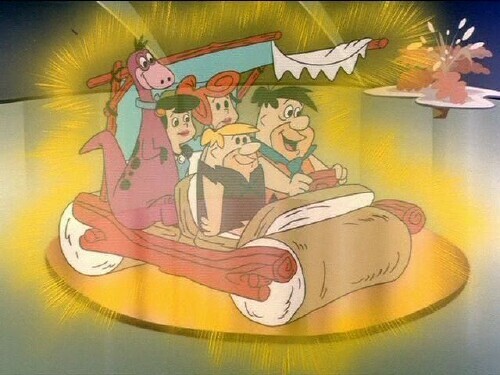 And since the Flintstones were under the time machine, they get taken to the future, whilst the Jetsons remain in the past. Now the two families must try to make the best of their current situations and eventually make it back to their own times. 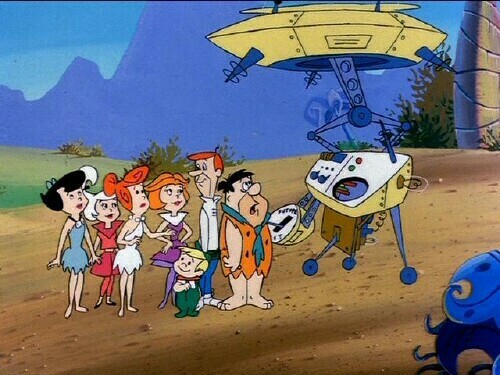 - The Jetsons actually work out better in the past than they did in their own time. 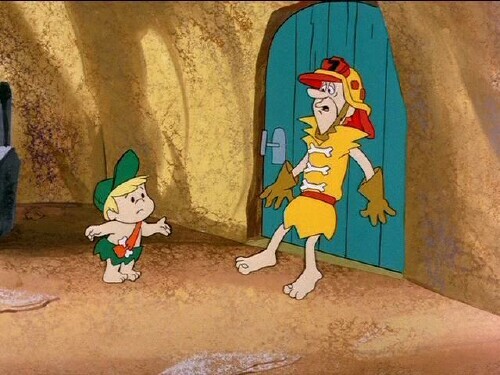 - No matter the time period, Fred is still a schemer. - R.U.D.I. falls in love, which has repercussions on his and George's job. - Judy falls in love, but it doesn't affect anything. - Dino and Astro don't get along all that much. - Where's Orbity? And for that matter, why does that creature exist in the first place? And there's so much more! I'm serious; it's almost as if the writers/creators/whomever tried to cram as much as they possibly could into this 92 minute production that at times, you will be annoyed. But it all works out in the end, but will it work out in the TOV Breakdown? Before this film ever existed in anyone's mind, who didn't want a crossover featuring characters from these two universes? I know I did and I was pleased when it finally came together, with the end result being most positive. 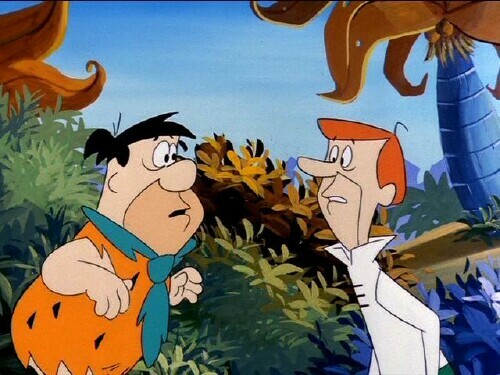 I was instantly sold when George and Fred first met, spouting their signature greetings "ooba-dooba" and "yabba-dabba". I loved it back in 1987 and I love it even more today. 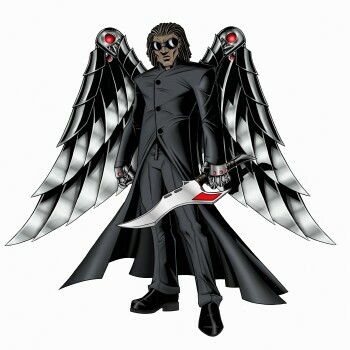 Most of the characters, involved in each universe are present and accounted for and no one family outshines the other. 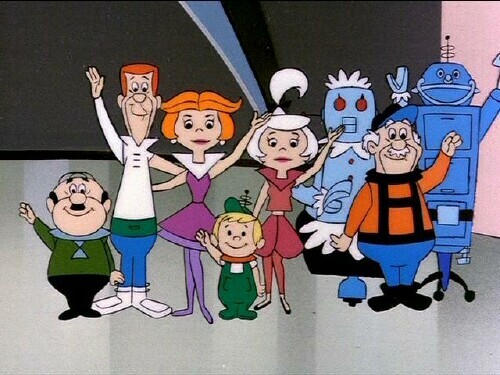 Overall The Jetsons Meet The Flintstones is a very well balanced and entertaining cartoon that was a joy to watch. There's so much going on that it'll make your head spin. It's not that bad really, but it makes the film seem longer than it actually is. 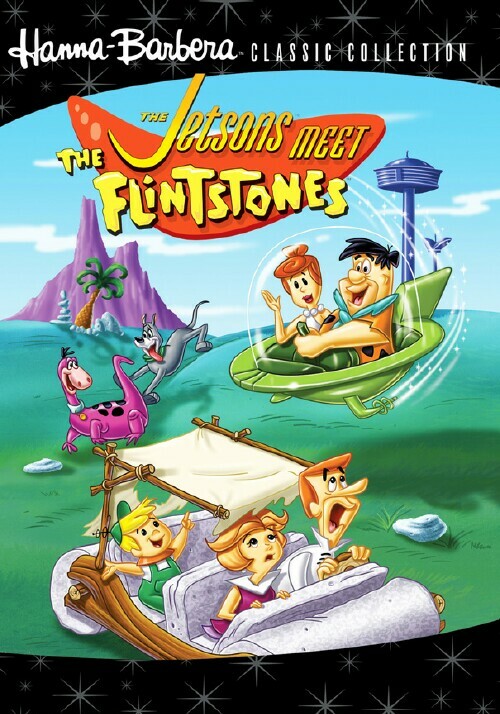 The Jetsons Meet The Flintstones DVD is available now and if you currently a fan or have just discovered both families, then this is one film you shouldn't pass up. 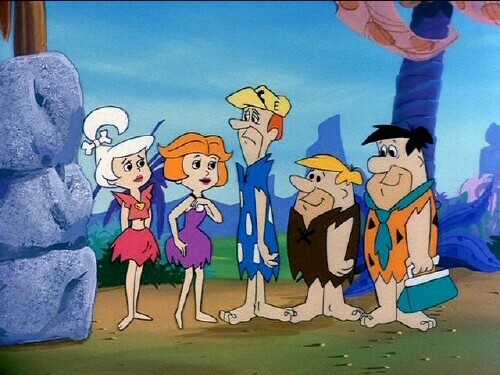 The family from the future meets the family of the Stone Age in a crossover that certainly won't disappoint. Out of TOV 5 stars, I give The Jetsons Meet The Flintstones a 4 and it's been Valkor Viewed, TOV Approved. The Bad: So much is happening!